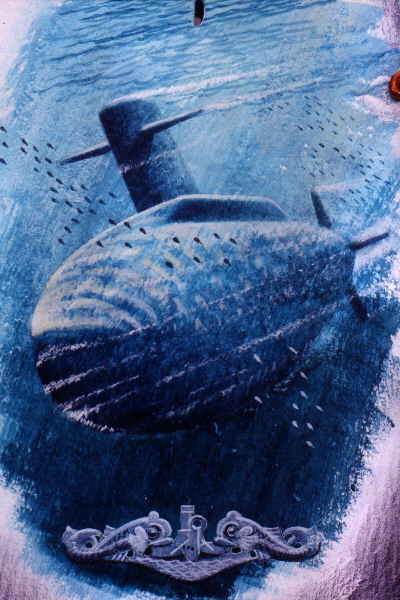 On January 17, 2004, the submarine family lost a beloved member and the Lionfish lost one of her best friends. 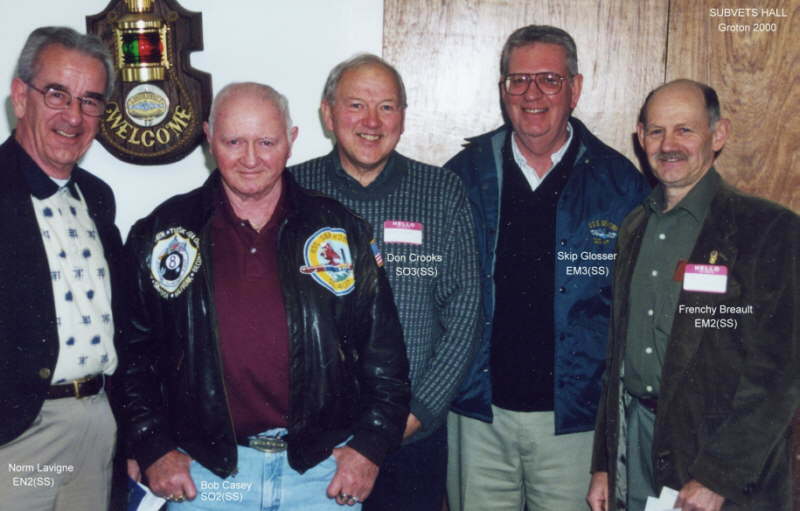 Paul Roggemann: I was first introduced to Bob in 1998 when I was planning the first 'modern' Sea Robin crew gathering at the Groton USSVI Clubhouse. My old COB, Bob Vera was kind enough to make all the local arrangements, line up food service, etc and I sent out invitations from the small list of shipmates and crewmembers that I had built at that time. As I recall I had probably 50-60 in those days and a good number of them were in the New London & New England vicinity. We had a great turnout, if only for a few hours on a Sat. afternoon. 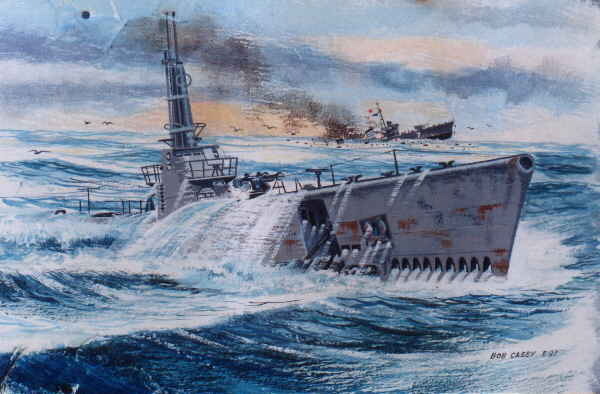 Bob Casey called one night and told me a bit about himself and said that he was scheduled to travel out to San Diego the morning after our party to attend a reunion for the destroyer that he had served on prior to going subs, but he would definitely do his damndest to be in attendance in Groton. He not only showed up, but came loaded down with all kinds of artwork that he had produced. He had not seen any of his shipmates from his days on the Robin, and he was overjoyed to be in contact again. It was a pleasure to be part of it, knowing that I was instrumental in it all happening. He gave all his artwork away to his shipmates, and a few very special pieces to me. We became good friends. 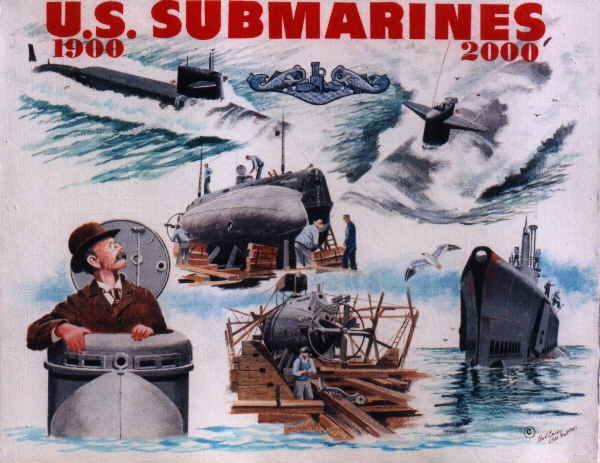 From that point I started planning a full-scale reunion in Reno for the USSVI Convention in 1999. I had big plans, never having done anything like this before, but one of the things I really wanted was to have some memento to give to all the crew that showed up. 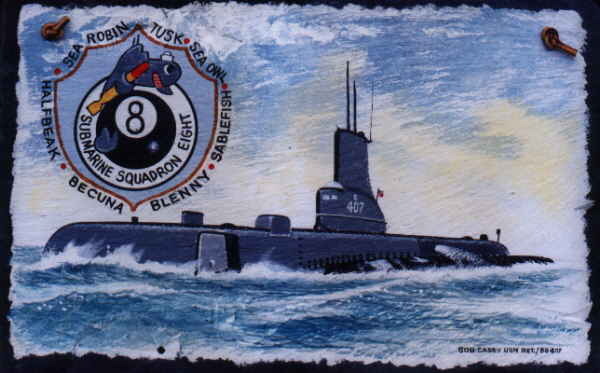 Bob and I worked on a reunion patch, and he produced some special paintings as well as Sea Robin Reunion '99 Cap. 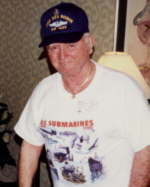 I know he had about 3 dozen very nice caps designed and manufactured, then instead of selling them as he planned, he gave them away to all our shipmates. He could not bring himself to ask anyone for money. He was that kind of guy. He also made some beautiful signs and a great banner that everyone signed. I still have those items and carry them to all the gatherings collecting signatures. I know he was very proud of his work on the Lionfish. He mentioned it often. I never was able to make it over there to see it with him, and do not know anyone that worked alongside him. I would have loved to have served with him. Sea Robin was a "special" boat, and shipmates like Bob Casey are what made it so. Don Gentry: I never had the pleasure of meeting Bob Casey but I enjoyed his posts about Lionfish and his pride and dedication to that boat! The images in the right column on this page are photos courtesy of Doc Gardner. Bob sent the photos to Doc as examples of his artwork on slate - as you can see, they are outstanding! Carlton G McMorrow: Bob Casey and I were in the same Graduating Class In High School. Off and on I was in Contact with Bob thru both the WWII Sub Vets where we were associate members and thru the USSVI. In the year 2000 I took Bob and his Lady friend with me to the Convention in Atlantic City. I have one of the T Shirts shown on his Memorial Page that he gave on that trip [above]. I will always remember Bob as a very talented Person who showed his pride of his Submarine Service in his Art work. 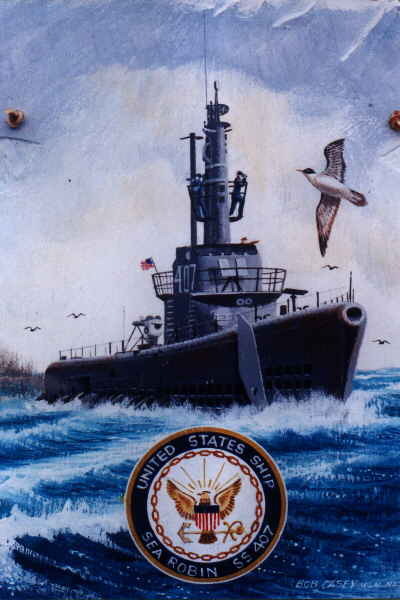 Bob was very dedicated to the USS Lionfish Memorial in Fall River MA and put in many hours working on her. 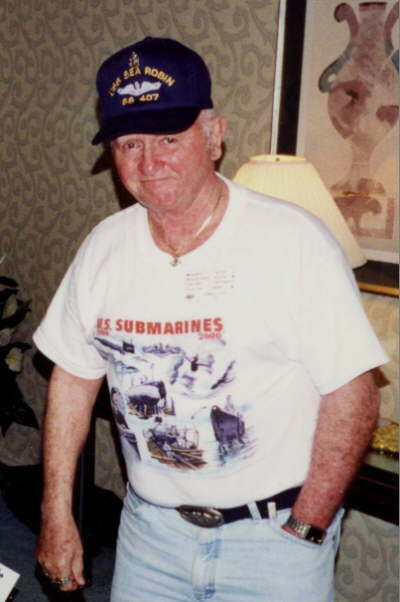 He was a very proud Submarine Vet and I am happy to have grown up with him. 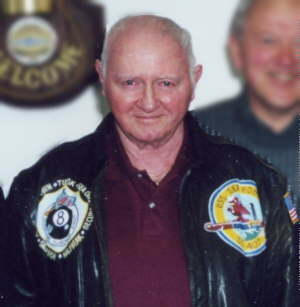 - Carlton G McMorrow, EMP2 SS, Boston Base USSVI Life Member. If you have a personal recollection you would like to add to this tribute, or any other materials, please contact the webmaster.